I rarely say things as syrupy sweet as this, but I “big pink puffy heart” homemade marshmallows. They are just SO simple to make (as long as you don’t get all crazy and decide to cut them into heart shapes, but who would do that? Oh wait, that’s me). 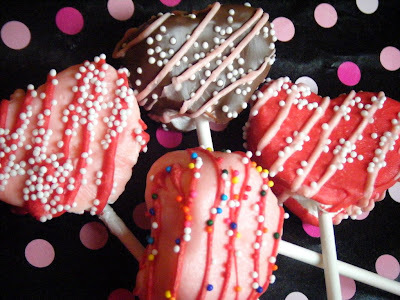 These homemade goodies are squishy & fluffy and oh-so yummy. I’ve made them twice before on my blog. The first time for s’mores for a camping trip, the second time for Christmas goodie bags. I used two different recipes in the past. While both recipes produced yummy marshmallows, I thought I had declared #2 the winner. Then I got some insight from one of my best friends who got to try both varieties, she told me her opinion on the differences. My annoyance with the first recipe was that it called for the Knox gelatin in Tablespoons. I liked that the second recipe called for a number of packets. BUT… after more intense consideration Katie pointed out that the second recipe sort of melts in your mouth more so than the first recipe. Almost similar to divinity, except squishy. The first recipe seemed closer to mass produced marshmallows according to her. 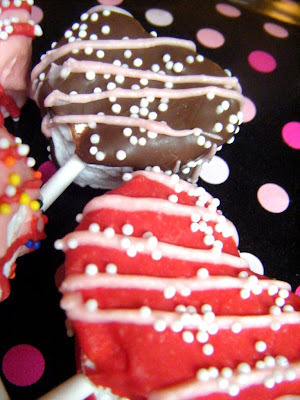 SO… when I got this CRAZY idea to make heart shaped marshmallows dipped in chocolate, I decided to try ANOTHER recipe. I turned to a trusted recipe source: MarthaStewart.com. *sigh* I never thought I’d jump on the Martha bandwagon, but her Cookie Book won me over. And, yet again, she did not fail me. I THINK…this recipe will be my final. Now, I haven’t gotten my marshmallow expert, Katie’s opinion yet (I’ve got to mail her marshmallows, let’s hope they survive), but I think this recipe combines the perfect texture of marshmallows. It’s squishy & soft, but not melt in your melt like divinity. This recipe also makes at least a 1/3 more than the previous recipe. My 13×9 pan was filled MUCH higher. SO, next time I make these I might pour it into two pans, or just do one again and keep them really thick! Another thing I liked about this recipe, is that the vanilla flavoring isn’t too overpowering. These don’t have a strong taste. When cutting these into heart shapes, I actually cut through it, then cut that heart in half. It was insanely thick. This took FOREVER. Literally. I think from now on I’ll stick to using a pizza cutter, because it’s super fast. No more cookie cutters! Whew! After every cut I would wipe down the cutter & knife with a paper towel that had been dabbed in canola oil. Also, because I made 50+ marshmallows, the dipping took FOREVER as well. Yikes. Good thing The Boy was out of town this weekend, I had no desire or energy to cook on Sunday after doing all this. I’ve taken Martha’s recipe, and arranged it in the way that works best for me, as well as added some tips I learned from my previous two recipes. Again, I STRONGLY suggest you only attempt this with a stand mixer. It requires beating for at least 12 minutes, and also beating while pouring in the boiling hot syrup. Put 3/4 cup cold water into the bowl of an electric mixer; sprinkle with gelatin. Let soften at least 5 minutes. Meanwhile, put granulated sugar, corn syrup, salt, and 3/4 cup water into a medium saucepan. Bring to a boil over high heat, stirring to dissolve sugar. Cook, without stirring, until mixture registers 238 degrees (soft ball stage) on a candy thermometer, about 9 minutes. Attach bowl with gelatin to mixer fitted with the whisk attachment. With mixer on low speed, beat hot syrup into gelatin mixture. Gradually raise speed to high; beat until mixture is very stiff, about 12 minutes. While mixer is beating take plastic wrap and line a 13x9 baking dish. Spray with non-stick spray. Once the marshmallow has been mixing for 12 minutes, beat in vanilla. Pour into prepared dish, and smooth with an offset spatula. Take another sheet of plastic wrap, spray with non-stick spray, and flatten onto marshmallow (this is the only way I've ever been able to get the marshmallow completely flat). Set aside, until firm, about 3-4 hours, or overnight. With wax paper or pastry mat underneath flip the pan over and remove it. Peel off what is now the top layer of plastic wrap. Use a long sharp knife, or pizza cutter (my preferred method), and gently wipe it with a paper towel dabbed in oil, or spray it with non-stick spray. Cut marshmallows into squares and toss in a bowl combined with equal amounts cornstarch & confectioners sugar. (I only add enough sugar & cornstarch as needed, as to not waste any. Then add more when necessary.) Kept in an airtight container, these will keep for at least a week. Packaged up and ready to go into both my & The Boy’s workplaces! 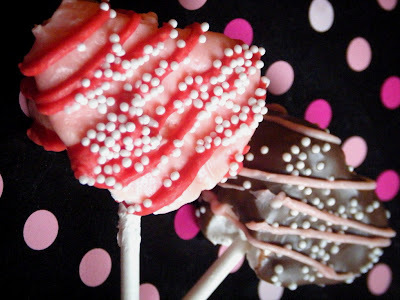 Ohhh my goodness those look amazing…and perfect for valentine’s day! They look great Erin, very festive! You could sale those as candy grams at work! 😉 I can’t wait to get my hands on one!! Yumi! Oh those are SO cute! I love them! Looks great and perfect for Valentines day! These look so good and they are beautiful!! These look fabulous! You did a great job on them. 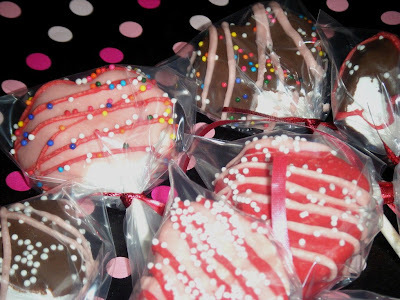 These are so pretty, I love homemade marshmallows. They’re so much better than the kind you buy in the store. So when is it that I get to sink my teeth into one of these!! Cute, very cute! Those are awesome! I made some for the first time at christmas time. WOW, what a project, not making them but all the dipping. Did you find that the powdered sugar/cornstarch blend (to keep 'em from being so sticky) kept your bark from adhering to the marshmallow? Messy & a lot of work! 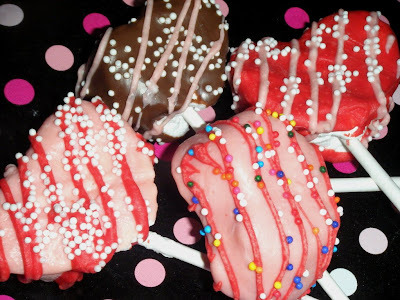 I put mine on toothpicks that I had sticking out of styrofoam blocks after dipping them but didn't think to make "pops". oh these are so cute! great pictures! they’re just perfect! Oh my, those are amazing!!!!! Great job! I just made marshmallows and was wishing I’d coated them in dark chocolate. Or added mint AND coated them in dark chocolate. Yours look absolutely lovely but they must have taken forever. By the way, I cut mine with a metal bench scraper. Of course, that would only work if they’re square not adorably heart shaped.